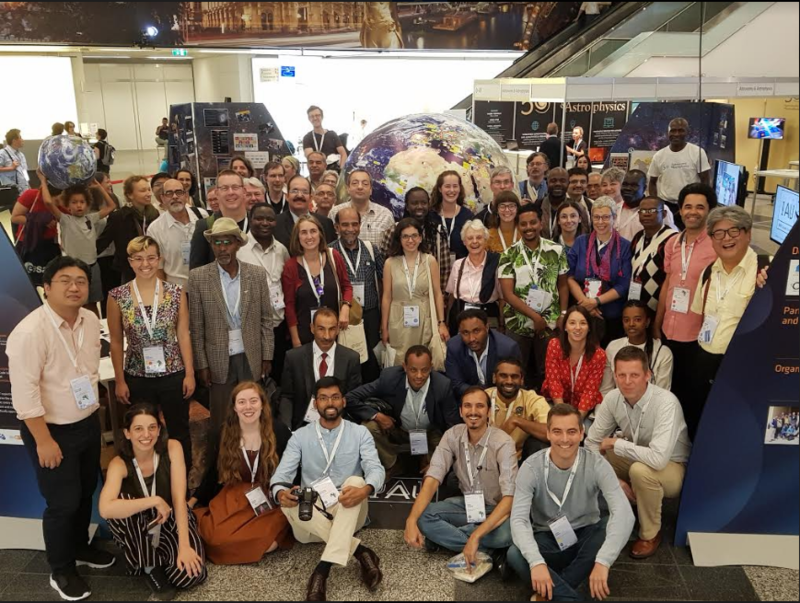 The 30th IAU General Assembly (GA) was held from 20-31 August 2018 in Vienna, Austria. The OAD organized the Focus Meeting 15 (FM15) on Astronomy for Development. More than 400 participants registered for FM15 which was held over 6 sessions between Tuesday 28th August and Friday 31st August 2018. The IAU General Assembly in 2009 ratified a visionary strategic plan which aimed to realise the impact of astronomy on global development. To implement these developmental objectives, the IAU partnered with South Africa’s National Research Foundation in 2010 to establish the Office of Astronomy for Development (OAD), hosted within the South African Astronomical Observatory in Cape Town. Over the years since the OAD has been in place there have been many lessons learned and resources developed to try to optimize the impact of astronomy on development. As of 2017 the OAD had administered over 120 projects that reached over 85 countries across the world; and negotiated the establishment of nine regional offices (based in Armenia, China, Colombia, Ethiopia, Jordan, Nigeria, Portugal, Thailand and Zambia) – with two of these offices serving as a joint language centre (Chinese and Arabic), and one serving as a dedicated language centre (Portuguese). In parallel over 600 volunteers registered with the OAD and nine organisations sharing this vision formed partnerships with the OAD. The OAD has thus positioned itself as a space for both the astronomy and development communities to explore and implement ways in which this science can positively influence the UN Sustainable Development Goals. This meeting focused on what development (and thus astronomy-for-development) actually means in a global context, highlighting what has been learned so far. FM15: Astronomy for Development comprised a series of invited and contributed talks, panel discussions, two poster sessions, and a brain- storming session. In particular the meeting aimed to bring together science communicators, experts from development and science policy backgrounds, and astronomers in the various Divisions of the International Astronomical Union. A key theme of FM15, and of the 30th IAU General Assembly in a broader sense, was the pronounced inclusion of astronomy for development in the 10 year strategic plan of the International Astronom- ical Union. This is articulated as Goal #3: \The IAU promotes the use of astronomy as a tool for development in every country”. It became clear through the submissions to FM15 that the landscape of astronomy for development is evolving rapidly. While the astronomy community has converged on a shared understanding of development where the United Nations Sustainable Development Goals are central, we are cognisant that \development” itself is a fluid concept, being rapidly redefined at global, regional and and domain-specific levels. Astro-tourism is emerging as a strong focus in the astronomy for development community. It has the potential to contribute to the economic empowerment of societies that live around observatories or other astronomy-related attractions. The United Nations sustainable development goals provide a broad, international focus for development e orts over the coming decade. Chinigo’s submission points out that it is possible to lose focus on small communities and individuals when adhering to a global definition, and care must be taken to conceptualise development at different scales: international goals, regional and community-based. Contributions from the astronomy for education community resulted in a renewed understanding of the topology of the astronomy education landscape (Bretones, Eriks- son, Alves-Brito, Gutierrez and many others). Specifically, the need for an astronomy teaching practitioners journals was highlighted. These developments are foundational for the establishment of the Office of Astronomy for Education in the forthcoming triennium. This new office will is expected to have a close, synergistic relationship with the Oce of Astronomy for Development and Office for Astronomy Outreach. Specific implementation possibilities include existing working groups, such as those on solar eclipses or magnetic activity (Division E), where clear opportunities for aligning science, outreach and education are available. A panel discussion lead by Division presidents or representatives suggested the establishment of an inter-divisional working group or think-tank that may interface with other disciplines to address development imperatives. Areas such as data and related techniques (Divisions B and H), high energy detector technology (Division D) and citizen science and astronomy education research (Division C) would benefit from and contribute to such a cross-disciplinary forum. Accessibility and inclusion featured prominently in the programme, with discussion of specific interventions (Voelker, Spuck, Gastrow & Diaz Merced) as well as systemic changes that would be required to allow broader participation in astronomy. This was complemented by similar focus from the IAU through the Inspiring Stars exhibition. In various sessions of FM15, it was noted that recognition and respect for the value that is added by social science (Lopez, Gastrow & Diaz Merced) and the progress that has already been made by other disciplines in the science for development narrative. Such awareness is essential in a field where progress is so strongly dependent on nurturing cross-disciplinary relationships.